The Monsoon Experiment (MONEX) was the core of the Global Atmospheric Research Program (GARP) Monsoon subprogram, which was a major international effort to achieve a better understanding of the planetary monsoon circulation, the major seasonal perturbation of the general circulation of the atmosphere and the influence of the annual cycle of precipitation associated with the monsoon on the agriculture of the many populous nations of the region. The Summer Monsoon Experiment (S-MONEX) was conducted over the Indian Ocean and adjacent land areas from May through August 1979, overlapping with the second Special Observing Period of the First GARP Global Experiment (FGGE). S-MONEX was a follow-on experiment to the Winter MONEX (W-MONEX) conducted in the South China Sea, December 1978 through March 1979. Twenty-one countries (mostly regional) with other major International countries including the U.S., U.S.S.R., Japan, France, Australia, India, and China, all participated in S-MONEX. 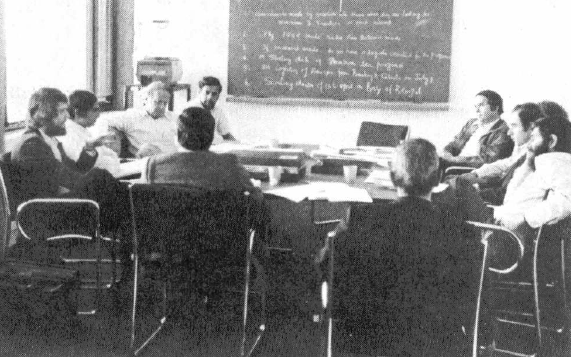 Three consecutive experiments (or phases) were conducted in S-MONEX: (1) Saudi Arabia Experiment based in Dhahran [early May 1979]; (2) Arabian Sea Experiment based in Bombay [mid-May to late June 1979]; and (3) Bay of Bengal Experiment based in Calcutta [July and August 1979]. The S-MONEX special observing system (see Network Map) was embedded into the “background” meteorological network of the World Weather Watch (WWW) and FGGE. The WWW upper-air network was augmented by special upper-air rawinsonde and Pilot Balloon (PIBAL) stations with releases as frequent as 4 times daily. In addition to normal agrometeorological, hydrological, and precipitation national networks, other S-MONEX special observing systems consisted of research aircraft, ships, special minisonde upper-air stations, radiometersondes, radars, constant level balloons, boundary layer measurement systems, and rocket soundings. Three U.S. S-MONEX Aircraft (NCAR Electra, NOAA P-3, and NASA CV-990) were all equipped with Omega Dropwindsonde systems, inertial platforms, and an extensive array of sensors for flight-level measurements. Auxiliary instrumentation including multi-spectral radiation (CV-990), cloud micro-physics and turbulent fluxes (Electra), aerosol and trace gases (Electra and CV-990), and digital radar, both nose and belly mounted (P-3). The 3 aircraft flew a total of 57 flight missions (389 flight hours) and released about 600 dropwindsondes. In addition, India provided a research aircraft (NRSA-AVRO) which was equipped with an inertial platform and standard flight-level parameters. The research ships in the S-MONEX region provided oceanographic measurements (e.g. sea surface temperature) as well as upper-air observations. Sixteen ships were on station for periods varying up to several weeks during the different phases of S-MONEX. Weather radars were provided by many of the nations in the S-MONEX region (both existing operational and special deployments). France made 90 low-level, super-pressure balloon releases from the Seychelles and Diego Suarez during May and June. The U.S. operated 2 double theodolite-tracked portable minisondes in Somalia during May and June. The U.S.S.R provided one ship-based rocketsonde system and India provided 3 land-based rocketsonde stations. The U.S. and India provided micrometeorological towers on the East Coast of India for the measurement of turbulent fluxes. The major scientific objectives of S-MONEX are described below. But during all three phases, additional scientific objectives included cloud physics, air chemistry, radiative, and boundary layer studies. I. Planetary-scale Aspects: (1) Investigation of heat sources; (2) Onset of monsoon [establishment and interaction of equatorial and monsoon troughs]; and (3) Breaks in the monsoon. (A) Arabian Sea Experiment: (1) Investigation of low-level monsoon flow (large-scale flow, low-level jet, boundary layer inversion); (2) Mid-troposheric cyclones; (3) Components of heat sources; (4) Mechanism of onset of monsoons (with better resolution than the Global Weather Experiment data set); and (5) Mechanisms of breaks in the monsoon (with better resolution than the Global Weather Experiment data set). (B) Bay of Bengal Experiment: (1) Development and structure of monsoon depressions; (2) Structure and energetics of monsoon troughs; and (3) Predictions of monsoon depressions. III. Interactions with Atmospheric Circulations in: (1) Pacific; (2) Southern Hemisphere; (3) Northern mid-latitudes; and (4) Stratosphere. IV. Numerical Simulation and Prediction: Addressing (1) Global modeling; and (2) Regional forecast problems. One ship-based rocketsonde (U.S.S.R), 3 land-based rocketsonde (India). Typical flight tracks flown during S-MONEX. 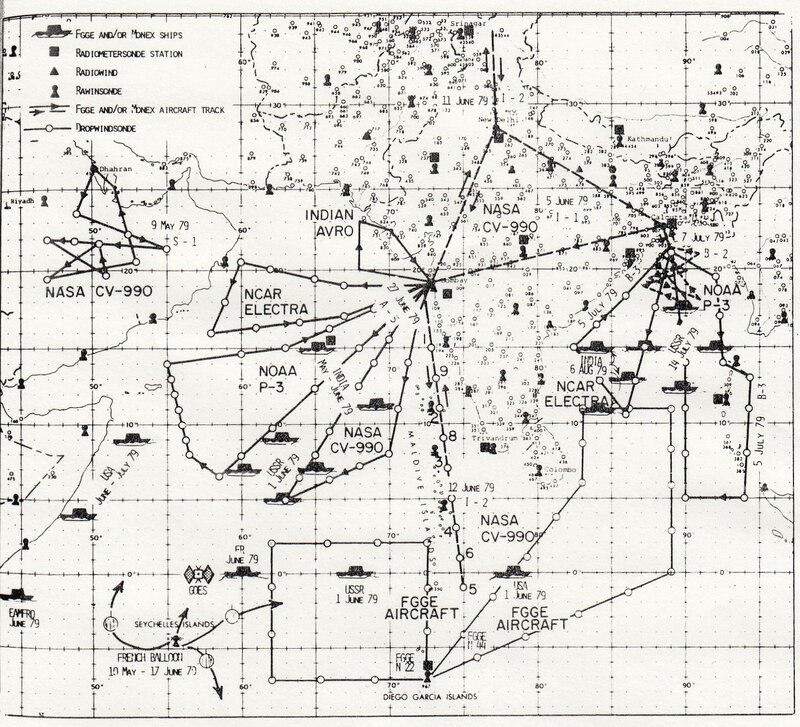 Upper left: Heat-low investigation over the empty quarter of Saudi Arabia (May 1979); Left center: Multiple aircraft mission over the Arabian Sea during the fully established monsoon (June 1979); Right center: Radiation missions flown between the Himalayas and the equator (June 1979); Lower center: Equatorial dropwindsonde missions flown by the FGGE aircraft (June 1979); Upper right: Flight missions over the Bay of Bengal during and after the monsoon depression (July 1979); and other MONEX observing systems (ships, constant level balloons, radiometersonde, and special upper-air stations) are also shown.